As you may know, in November 2017 Redwerk team visited Europe’s largest tech conference Web Summit. This year we decided to continue our journey and make a trip to New Orleans where a Web Summit’s little cousin – Collision Conference was held. The three-day Collision Conference brought together around 25 000 attendees from 120+ countries at Ernest N. Morial Convention Center in New Orleans, LA. And here’s where the collision is hidden. New Orleans is known to be one of the most artistic places in the USA, the homeland of Jazz music and numerous famous cocktails. It skillfully combines Spanish and French cultures with Voodoo magic and creates this special atmosphere of the southern city. And Collision conference, known as one of the fastest growing tech conf, brings thousands of techies and geeks to the slow-paced relaxed flow of the city of musicians and artists. All three days at #CollisionConf were incredible. With 600 startups it was a challenge to check all of them, but #Redwerkteam did our best. Thankfully, our friend from New York, Rachel joined us at the Collision and helped to cope with the tight schedule! It was a great pleasure to take part in the #Alpha selection, hear new ideas and feedback for our @spamhoundapp and discuss numerous future collaborations. Lots of inspiring talks, promising connections and revolutionary ideas. No wonder #NewOrleans was chosen for the event. The Big Easy has its own extraordinary #jazzy charm and relaxing southern atmosphere. The fast pace of the conference days perfectly mixed with no-rush evening networking around the bars of famous #BourbonSt and #FrenchmenSt. Next year Collision moves to Toronto, Canada. For sure it’s going to be a bit colder but hopefully, even bigger and better! Well, that’s a joke of course, but this line contains all top trends among presented startups. Each year organizers of the conference choose the most groundbreaking startups from thousands of requests and provide exhibition stands to representatives of the most innovative ideas from over 18 different industries. We were proud to get a place in Alpha section and exhibit our SpamHound app among the most progressive projects around the world. And yes, we met a lot of AI startups that help people to do their business more efficiently, blockchain projects that offer their users to decentralize everything around and marketplaces & social networks to any taste. Phew, our exhibition day was a blast! After two days of continuous circling around the huge conference halls, we finally had our spotlight day in the Alpha section. The whirlpool of people at our stand included media guys, AI revolutionizers, artists, pet lovers and lots & lots of friends we’ve met here during @collisionconfhq Many thanks to #DoubleAmor, @bigbluepeople, @snov.io, @beanjungle, @studiomekka, @wear_studio, @betterdoctor, @the_ecocuriean and everyone for stopping by our stand today! 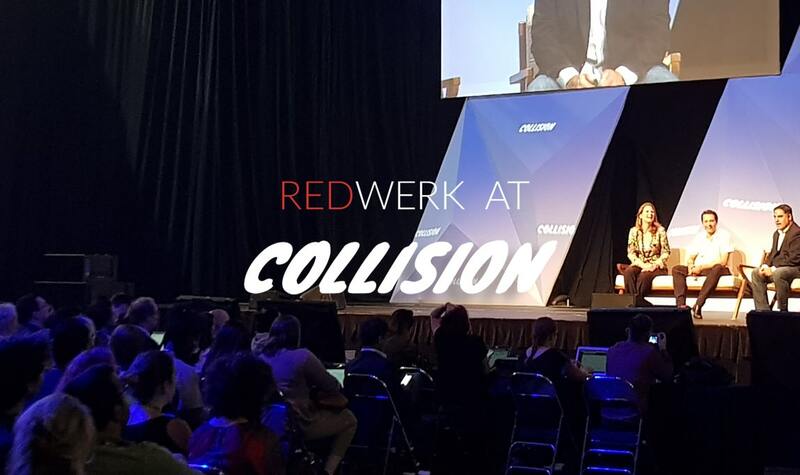 @spamhoundapp & @redwerkit are so happy be a part of #collisionconf this year in New Orleans! Unlike many other conferences, Collision decided not to divide startups by industry. They mixed everything making it’s easier to get lost in the variety of projects but also finding real gems where you would never look. After busy days full of new meetings, conversations, progressive ideas and useful information from speakers, Collision offered its attendees to keep up with a flow of events in New Orleans and informally interact with investors and mentors at pub crawl sessions and Night Summit events. And it’s not surprising, for a few reasons. First one is that Collision is created by Irish, and we all know that pubs are a part of Irish culture. Second is that the Big Easy is famous for its old bars on Bourbon Street and French Quarter, that every tourist should visit. One of them is Lafitte’s Blacksmith Shop, that was built in 1772, still working nowadays. By the way, world known cocktail Hurricane was invented in Pat O’Brien’s bar in New Orleans. Collision managed to beautifully mix the traditional southern atmosphere with progressive tech projects and create perfect conditions for informal and productive networking. A classy way to sum up a big tech event: gather together the most interesting people we met at #CollisionConf for steaks. At this table we have: Ukraine, Israel, USA and Cameroon. Everyone appreciated USDA ribeye and red wine from Paso Robles. Many people believe that if you throw a coin in a fountain in any city in the world, you will definitely return there again. In New Orleans, we were original and left our sticker on one of the streets lamp posts during the daily Night Summit. We hoped that we would return to New Orleans on Collision 2019, but found out that the meeting point for Collisioneers changed to Toronto next year. Canada’s Prime Minister Justin Trudeau announced this news personally and mentioned that Toronto is home to many startups, over 18 000 tech companies, and 400 000 qualified specialists. Sound exciting, ha? We should say that the motto ‘’North America’s fastest growing tech conference’ is 100% about Collision! Our team is deeply inspired by the atmosphere of the place where the world most progressive minds met with the artistic magic of New Orleans. We were happy to show SpamHound to the huge audience, met creative people that change our everyday life, visited numerous unusual places in New Orleans! Meet you next year, Collision! See you in Toronto! Being neoteric outsource development IT company, Redwerk develops cutting-edge solutions for a variety of industries such as eCommerce, Business Automation, eHealth, Media & Entertainment, eGovernment, Game Development, and of course, for Startups & Innovation. We create outsourcing case studies for the major projects in order to analyze all the pros and possible cons to improve ourselves. Since 2005, our dedicated team successfully released and continues to provide IT development services for manifold businesses, both for small and medium-sized, and corporations.